BANGKOK — The travel and tourism industry today generates over $7.6 trillion globally, supporting over 292 million jobs, and has outstripped the growth of the global economy in the last six years. Such is the economic power of the travel and tourism industry that it was highlighted as a driver of three of the 17 UN Sustainable Development Goals: inclusive and sustainable economic growth; sustainable consumption and production; and sustainable use of oceans and marine resources. “This sector plays a vital part in the global quest for a more equal, inclusive and sustainable world,” said David Scowasill, World Travel & Tourism Council president and CEO, in his opening speech Wednesday at the WTTC Global Summit in Bangkok. Some 900 travel and tourism industry personnel from around the world attended the two-day conference, exploring the power of their businesses to transform the world. Looking beyond the economic implications of the travel and tourism industry, World Tourism Organization Secretary-General Taleb Rifai highlighted how tolerance and understanding could be promoted by the sector. “Travel has become a human right,” he said, though it is challenged by a number of issues, including safety and security, and the disruptive power of technology, among others. The impact of globalization on the travel and tourism industry and its repercussions were discussed by many of the experts at the conference. David Cameron, prime minister of Britain from 2010 to 2016, discussed his experience in taking charge of the effort to promote Britain as a tourism destination. “I personally chose the ‘Britain is Great’ campaign,” he said. 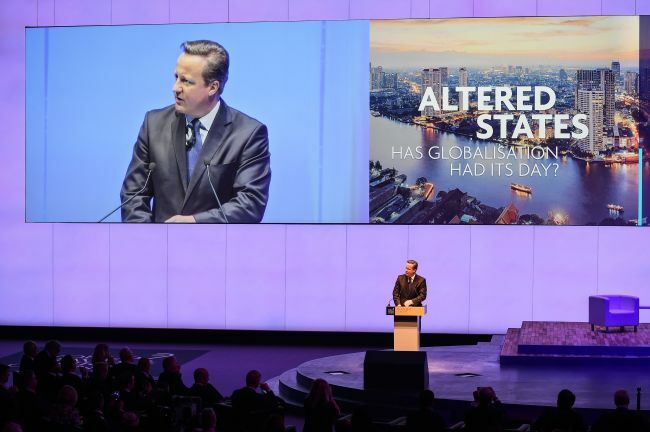 Arguing that promoting tourism is “not national vanity but national opportunity,” Cameron said that tourism is attractive because it has the capacity to create growth quickly. Stating that tourism has the power to transform a nation, Cameron said decisions must be made on a number of broad issues. For example, while the benefits of globalization are obvious, there is a need for a serious correction in its course because some are being left behind. “Businesses and government must work together to reform globalization,” he said. Cameron also highlighted the need to be clear about challenges ahead. “The biggest threat is Islamic extremism,” he said, as it has an impact all around the world. US President Donald Trump’s attempts to institute a travel ban on a number of Muslim-majority nations is an example of what the extremists want to achieve. The importance of China in the tourism market was also on the minds of many speakers at the meeting. According to ForwardKeys, which predicts future patterns by analyzing 16 million booking transactions a day, China’s power to make or break a destination is demonstrated by the recent trends in the number of visitors to South Korea. “Beijing’s anger at the stationing of US THAAD missiles in South Korea is having a marked impact,” it said, citing its data that revealed international arrivals in South Korea for stays of four to eight nights fell 10 percent in the first quarter of this year due to cancellations by Chinese tour groups in March. “Forward bookings for the same category are currently lagging 28 percent, year on year,” the company said. Data showed that ASEAN countries are the most likely to benefit from South Korea’s “crisis,” as Chinese travelers turn to ASEAN. “The deployment of THAAD missiles in South Korea has torpedoed its inbound tourism industry,” said ForwardKeys founder and CEO Olivier Jager. On Thursday, the WTTC recognized the best practices in sustainability in travel and tourism with the Tourism for Tomorrow Awards, which has five categories. The Botswana Tourism Organization received the Destination Award for its dedication to conservation and preservation, while the Environment Award went to Misool Eco Resort, a dive resort and conservation center in Indonesia that prohibits all fishing, shark finning, turtle hunting and egg collection in the area. The Innovation Award went to The Mapping Ocean Wealth Initiative of the US-based Nature Conservancy for its solutions to sustainability challenges faced by the travel and tourism industry. The J. Willard and Alice S. Marriot Foundation’s China Hospitality Education Initiative won the People Award, which recognizes dedication to the training and education of the tourism workforce, while the Community Award was given to Kenya’s Ol Pejeta Conservancy for the group’s sustainable tourism leadership in local community development.